This article is about a car. For other uses, see Belvedere (disambiguation). Los Angeles Assembly, Maywood, California, St. Louis Assembly, Fenton Mo. The Belvedere name was first used for a new hardtop body style in the Plymouth Cranbrook line for the 1951 model year. In 1954. the Belvedere replaced the Cranbrook as the top trim and became a full model line with sedans, station wagons and convertible body styles. 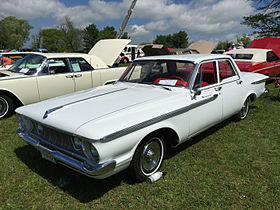 The Belvedere continued as Plymouth's full-sized car until 1965, when it became an intermediate, and was replaced after the 1970 model year by the Satellite, a name originally used for the top-trim level Belvederes. Introduced on March 31, the 1951 Plymouth Cranbrook Belvedere is a two-door pillarless hardtop. It was Plymouth's first such body design and was introduced in response to the 1950 Chevrolet Bel Air, and the Ford Victoria, the first two-door hardtop in the low-priced American market. The Cranbook Belvedere was the name for the two-door hardtop version of the Cranbrook and built on the same 118.5 in (3,010 mm) wheelbase. Powering the Belvedere is the Chrysler flathead 217.8 cu in (3.6 L) straight-6 engine with a 7.00:1 compression ratio producing 97 hp (72 kW; 98 PS) (SAE gross). For 1952, Plymouth kept the Cranbrook Belvedere largely unchanged. The biggest alteration was to the color scheme; to further distinguish the top-level Belvedere from other Plymouths, the two toning now flowed from the roof over the beltline onto the trunk, which has been referred to as the "saddleback" treatment. Two-tone color schemes were "sable bronze" over suede, black over "mint green", and gray over blue. Overdrive was made available as optional equipment in the 1952 Plymouth. In overdrive, the engine made three revolutions for each rear wheel revolution against four without overdrive. The engine was a complete carry over from 1951. Production for 1951 and 1952 totalled 51,266 units. The Belvedere remained a part of the Cranbrook series through the 1953 model year, which saw all Plymouth models completely restyled. Major style changes include a shorter 114 in (2,900 mm) wheelbase, a one-piece windshield, flush rear fenders, and a lower hood line. In April 1953, Plymouths received the Hy-Drive semi-automatic transmission. The engine was carried over from 1952 with the only enhancement being a slight increase in the compression ratio to 7.10:1, which yielded a rating of 100 hp (75 kW). A total of 35,185 1953 Belvederes were sold. The Belvedere replaced the Cranbrook as the top-line offering for 1954. Now, a separate model instead of just a two-door hardtop, it was also available as a convertible, two-door station wagon, and four-door sedan. The two-door hardtop version was now called the "Sport Coupe". 1954 Belevederes featured full-length rocker sill moldings. Minor styling updates adorned the carry-over body design. For the first time, small chrome tailfins appeared on the rear fenders. In March 1954, Plymouth finally offered a fully automatic transmission, the Chrysler PowerFlite two-speed. Also new was a larger standard engine: a 230.2 cu in (3.8 L) I6 that was also used by the Dodge Division. Power was now rated at 110 hp (82 kW). Belvedere production totaled 32,492 for the year. All Plymouths were treated to a major overhaul for the 1955 model year. This was the first year of Chrysler Stylist Virgil Exner's "Forward Look." The Belvedere returned as top-of-the-line. For 1956, Plymouth styling evolved from that of the 1955s. Most notable would be the introduction of the first push-button automatic transmission to appear in an American automobile, and a more dramatic rear-end treatment highlighted by a pair of rakish tail-fins. In early 1956, the Fury joined the Belvedere line as a special-edition high-performance coupe. Belvedere remained the top full-line series through 1958. In 1956, Plymouth added seat belts. In 1956, Chrysler's chief engineer in a public relations campaign took a Belvedere and had a turbine engine fitted instead of the standard gasoline engine, and was driven across the US. 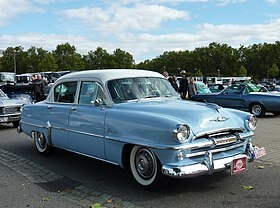 The 1957 model year had high sales for the Chrysler Corporation, and for the Plymouth line. Plymouth's design was so revolutionary that Chrysler used the slogan "Suddenly, it's 1960!" to promote the new car. Standard on all body styles except the convertible was the "Powerflow 6" L-head engine. The convertible was only V8 powered and V8s were available in other Belvederes with an optional "Fury" 301 cu in (4.9 L) version as well as a "High-Performance PowerPAC" at extra cost. A manual transmission was standard with the push-button two-speed PowerFlite optional and the push-button three-speed TorqueFlite automatic also optional on V8 cars. The Belvedere would once again return as a top level trim for 1958 for the last time. Styling was a continuation from the 1957 models. A big block "B" engine of 350 in3 V8 with dual four-barrel carburetors dubbed "Golden Commando" was optional on all models. For 1959, the Fury became the top range with a full array of sedans and coupes, and the Belvedere became the middle range. The Savoy became the least expensive model, and the Plaza was discontinued. The convertible was only available in the Belvedere model between 1956 and 1958. The 1957-58 Belvedere two-door hardtop gained notoriety from the Stephen King movie Christine (1983). 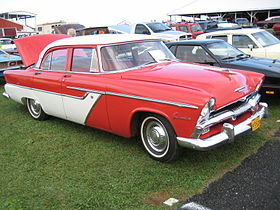 In the opening of the movie, it is indicated that Christine is a 1957 Fury, though the standard color of the 1957 Fury was not red. 1957 Fury had standard Sandstone White with gold anodized aluminum trim. For the movie Christine is painted "toreador red" with an "iceberg white" top. Starting in 1960, Belvederes got a brand-new standard inline six-cylinder engine replacing the venerable valve-in-block "flathead" six. Colloquially known as the slant-6, it displaced 225 cu in (3.69 l), featured overhead valves, and a block that was inclined 30 degrees to the right to permit a lower hood line with maximum displacement. This engine used a single-barrel Holley carburetor, and became known for its extremely rugged construction, exceptional reliability and longevity. V-8 engines continued to be optionally available, in displacements of 318 cu in (5.21 l) and 361 cu in (5.92 l). Unit body construction was introduced throughout the line, though it appeared on certain Plymouths in earlier years such as the 1953 hardtop coupe. This eliminated the frame, and was advertised as Unibody. Under Chrysler president William Newberg, Virgil Exner's styling team was encouraged to go "over the top" with distinctive styling, leading the 1960 models to be popularly dubbed the "jukebox on wheels" and the 1961 models to be widely considered among the ugliest cars ever mass-produced. Despite being remarkable cars in performance, handling, modest weight, and appealing interiors, sales suffered, and Plymouth yielded third place in sales to Rambler. The 1962 model year full-size Plymouths were "downsized", with more compact outside dimensions. American car buyers at the time were in the thought mode of "bigger is better", and sales of these models suffered. However, the smaller Plymouth provided greater owner approval in their actual use. A Plymouth Belvedere with six-cylinder engine and automatic transmission was compared to the intermediate-size Ford Fairlane and the compact-size Chevrolet Chevy II in an economy test by Popular Mechanics and the road test concluded that the Belvedere was "a very pleasant transportation package." Another advantage of the smaller and lighter body was in drag racing. The 1963 and 1964 models used the same unibody platform as the 1962s, but were restyled to look longer and wider. The 1964 Belvedere (and corresponding Fury hardtop coupes) featured a new "slant-back" roofline that proved to be popular, and sales improved significantly over the previous design. The 1964 Belvedere was also the car used to introduce the 426 Chrysler Hemi engine, which used a canted large-valve arrangement. This was such a significant high-RPM breathing improvement that Hemi-equipped Plymouth Belvederes won first, second, and third at NASCAR's 1964 Daytona race. One of the winning drivers was Richard Petty. In 1965 Plymouth once again made the Fury a full-size car, and Belvedere ostensibly became the intermediate size offering, though in fact the Belvedere was little changed, and most dimensions and weights remained the same—the Fury was merely enlarged, restoring a full-sized line which Plymouth had been sorely lacking. The Belvedere line was divided into the Belvedere I, Belvedere II and Satellite subseries, the latter available only as hardtop coupe and convertible, and featuring the 273 cu in (4.47 l) "LA block" V-8 as standard equipment. The line was restyled in 1966, and the high-performance GTX was added in 1967. The pilot episode for the television show Adam-12 featured a 1967 Belvedere as the standard LAPD police cruiser. In 1968, the Belvedere - along with the rest of Chrysler's B-body offerings - was reskinned with "Coke bottle styling." The Belvedere II was dropped, but the Sport Satellite was added to the overall lineup, using the same sheetmetal. The new LA-style lightweight 318 engine was introduced for this year and would remain available on the Belvedere through its life. The Plymouth Road Runner was introduced as a low-price, high-performance alternative to the GTX, and Richard Petty won the Grand National championship in NASCAR in a Belvedere. However the GTX came standard with the 440 CID engine and the Road Runner with the 383 Magnum, with the only engine options being the 440 six barrel or the 426 HEMI engines. The Belvedere name was dropped at the end of the 1970 model year, replaced by the Satellite name originally reserved for higher-end Belvederes. It lasted only through 1974, becoming the Fury in 1975 when the longer-wheelbase Fury model became the Gran Fury. Belvederes were used in police service from the late 1960s to the early 1970s, when they were replaced by the Plymouth Gran Fury. They were prominent in both the LAPD and New York Police Department. 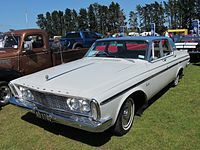 The Plymouth Belvedere was also produced by Chrysler Australia. The first model, based on the 1953 US Plymouth, featured a high level of Australian content, with body panels pressed in Chrysler Australia's Keswick facility in South Australia and matched with a 217.8 cubic inch (4107cc) side-valve six-cylinder engine, imported from Chrysler UK. 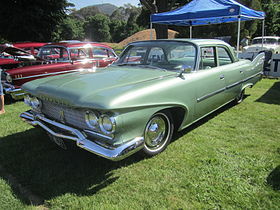 It was produced as a four-door sedan and as a locally developed two-door coupe utility, along with similar Cranbrook and Savoy models, until it was replaced by the Chrysler Royal in 1957. 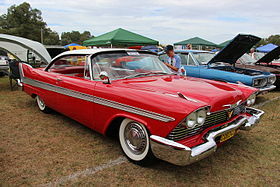 The Belvedere was reintroduced to the Australian market in early 1958 when Chrysler Australia began assembling the current model Belvedere four-door hardtop which was imported from the US in knocked-down form. The 1959 model was equipped with a 318 cubic inch V8 engine and push-button automatic transmission. Chrysler Australia replaced their Plymouth Belvedere, Dodge Custom Royal and De Soto Firesweep models with the Dodge Phoenix in 1960. During Oklahoma's 50th anniversary, a new 1957 Plymouth Belvedere was sealed in a concrete enclosure as a time capsule in downtown Tulsa on the grounds of the brand new county courthouse. It was unearthed June 14, 2007 during the state's centennial celebrations, and was publicly unveiled on June 15. In line with the Cold War realities of late 1950s America, the concrete enclosure was advertised as having been built to withstand a nuclear attack. The concrete enclosure, however, was not airtight and allowed water to leak in, which caused significant damage to the vehicle. The controversial televised vehicle customizer Boyd Coddington was to have been the first to start the unburied car, had it been operable. The car was the prize of a 1957 contest to guess the population of Tulsa in the year 2007. The winning entrant, one Raymond Humbertson, guessed 384,743 versus the actual figure of 382,457. However, Humbertson died in 1979 and now only distant relatives remain. A second such car, this one a Plymouth Prowler, was encased in a vault in Tulsa's Centennial Park (formerly Central Park) 1998 to celebrate the city's centennial. After it was discovered what had become of the 1957 Belvedere, the Prowler was moved above ground, and a mound was formed over it. It is to be revealed after the same period of time as the Belvedere, in 2048. ^ Gunnell, John. Standard Catalog of American Cars 1946-1975 (Fourth ed.). pp. 646–649. ^ "Directory Index: Plymouth/1956 Plymouth/album". Oldcarbrochures.com. Archived from the original on September 30, 2010. Retrieved 2011-11-20. ^ "We Drove A Turbine Car Coast-To-Coast." Popular Mechanics, June 1956, pp. 72-76/252. ^ "1957 Plymouth prestige brochure". oldcarbrochures.org. pp. 2–3. Archived from the original on 9 May 2016. Retrieved 26 April 2016. ^ "Specifications: 1957 Plymouth brochure". oldcarbrochures.org. p. 12. Archived from the original on 9 May 2016. Retrieved 26 April 2016. ^ "Smaller Plymouth wins greater owner approval". Popular Mechanics. 117 (2): 95–99, 246, 248, 250. February 1962. Retrieved 2 October 2015. ^ Whipple, James (January 1962). "Drive Comparing Ford Fairlane, Plymouth Belvedere, Chevy II". Popular Mechanics. 117 (1): 104–108, 244, 245. Retrieved 2 October 2015. ^ Redgap, Curtis (2003). "Which came first, the Plymouth or the Petty?". Allpar. Retrieved 2 October 2015. ^ a b c d Gunnell, John, ed. (1987). The Standard Catalog of American Cars 1946-1975. Krause Publications. pp. 665–671. ISBN 978-0-87341-096-0. ^ Auto Editors of Consumer Guide (6 December 2007). "1965, 1966, 1967 Plymouth Belvedere/Satellite and GTX". HowStuffWorks. Retrieved 2011-04-20. ^ World staff. "Buried Belvedere vault full of water". TulsaWorld. Archived from the original on 2013-02-04. Retrieved 2011-11-20. ^ "Updated: Belvedere rusty but still has personality". TulsaWorld. 2007-06-15. Archived from the original on 2011-09-27. Retrieved 2011-11-20. ^ "Miss Belvedere, you have a winner: But Raymond Humbertson died in 1979". TulsaWorld. 2007-06-23. Archived from the original on 2013-02-05. Retrieved 2011-11-20. Wikimedia Commons has media related to Plymouth Belvedere. This page was last edited on 10 April 2019, at 04:42 (UTC).